At next weekend's Barrett Jackson Scottsdale auction the first 1969 Dodge Charger ever used in "The Dukes of Hazzard" will cross the block with No Reserve. The car was used and destroyed filming a jump off a dirt ramp that was featured in the opening of all 145 episodes of the show. Although the car was basically destroyed filming that scene the jump is one of the most recognizable moments from the show's seven seasons. The "Lee 1"—as it was referred to by Warner Brothers—was discovered and subsequently restored five years ago. Interestingly the car was restored to the exact condition it was in during its brief television career—sloppy graphics and all. It's impossible to know what this "General Lee" will bring when it crosses the block during prime-time next week without reserve. 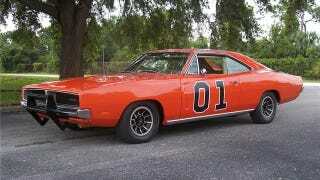 Although the car is a base model Charger, it is one of the more famous examples of the iconic bright orange Dodge. We'll be anxiously watching to see exactly what the car sells for, but we feel pretty safe saying it will be quite a bit more than the average 383 equipped 1969 Charger.